Home / غير مصنف / Article 13: What is Article 13? Are memes BANNED? What has the EU banned? Article 13: What is Article 13? Are memes BANNED? What has the EU banned? Under the new rules, technology companies will be responsible for material posted without the proper copyright permissions. The Copyright Directive was backed by 348 MEPs, with 278 against. Those in favour of the new law say it will compensate artists and musicians fairly. But critics say it will destroy user-generated content, and alter the nature of the net. Each EU member state must now approve the decision to implement the law, and if they do they have two years to do so. 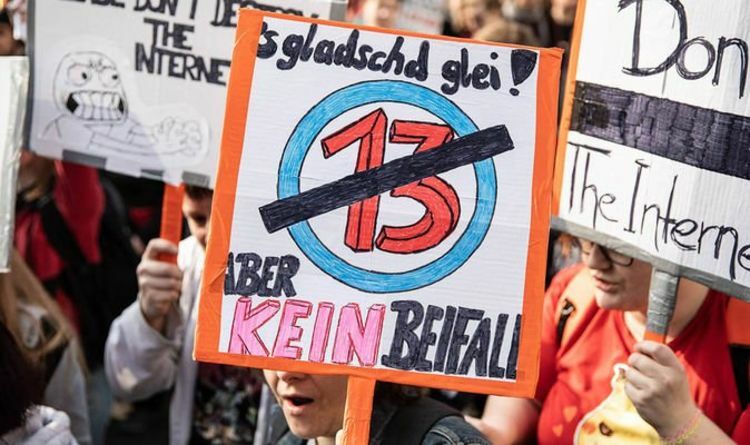 Article 13 covers how "online content sharing services" should deal with copyright-protected content, such as television programmes and movies. The rule applies to services that primarily exist to give the public access to "protected works or other protected subject-matter uploaded by its users”. This means it’s likely to cover services such as YouTube, Dailymotion and Soundcloud. Article 13 says content-sharing services must license copyright-protected material from the rights holders. If that is not possible and material is posted on the service, the company may be held liable. These rules apply to services that have been available in the EU for more than three years, or have an annual turnover of more than €10m (£8.8m, $11.2m). The European Parliament said that memes - short video clips that go viral - would be "specifically excluded" from the Directive. Article 13 says it shall "in no way affect legitimate uses" and people will be allowed to use bits of copyright-protected material for the purpose of criticism, review, parody and pastiche. However, it remains unclear how tech firms would be able to enforce that rule with a blanket filter.